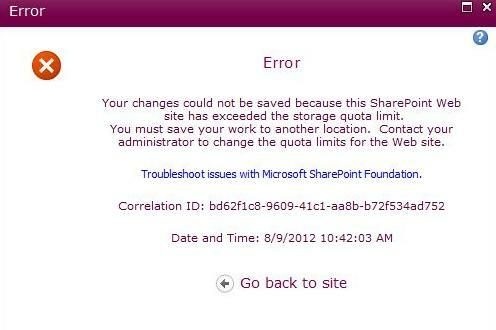 Sharepoint Logics: Your changes could not be saved because this SharePoint Web site has exceeded the storage quota limit. "Your changes could not be saved because this SharePoint Web site has exceeded the storage quota limit. You must save your work to another location. Contact your administrator to change the quota limits for the Web site"
Monday morning....the teams started getting error saying " Your changes could not be saved because this SharePoint Web site has exceeded the storage quota limit. Had a look and found that this error is happening because of the storage quota limit which is set in SharePoint Central Admin. SharePoint sets appropriate quota size for the site template and for the site collection. As part of the architecture usually disk and space assessment will be done and appropriate quota will be decided , SharePoint will be set to a default limit if you have not pre-configured it. That's it..for now you can be relieved.